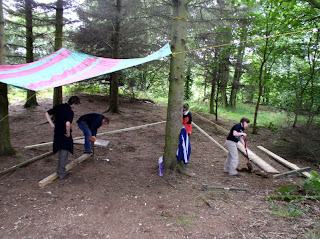 Above : New backwoods shelter area - staff pretending to be really busy for the camera! Despite the widespread availability of cheap, waterproof tents, many campers at Fordell prefer to sleep in much more basic conditions - no doubt having been inspired by Ray Mears and others. The site has had a backwoods cooking area for many years which is well used, but this weekend the staff started work on a new backwoods area elsewhere in the site where groups will be able to bivi overnight in minimal style and hopefully still keep fairly dry. The new area is in an unused part of land near the abseil wall and will have a large open-sided shelter (see photo above) using a big tarp, with a smaller wooden-framed shelter for sleeping in next to it (bottom photo). Although not quite blending in with the trees (since you don't tend to get pink and green trees in Fife) the tarp shelter looks like it will do the job and will also enable groups to have a small fire underneath on top of some slabs. After numerous ideas for the smaller shelter were discussed and rejected, it was decided to build a timber-framed structure which would then have canvas stretched on top - hopefully then allowing perhaps 10 people to sleep underneath. After a few mis-measurements and non-linear sawing from the less DIY-skilled members, in stepped woodworking pro Henry to finish things off and teach the youngsters a thing or two about hammering nails in without them bending! By sunday evening most of the work had been completed with a few more things to finish off - photos of the final shelters will appear soon and they will no doubt be thoroughly tested by groups shortly. 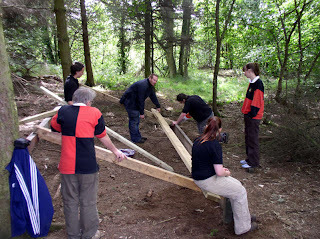 Above : Due to a shortage of posts, 4 of the staff had be sunk into the ground to use as uprights for the new shelter.